For our joint rulership project, Red and I will be using the scrying tool known as “Dwarf Fortress”. Dwarf Fortress, in fortress mode, puts you in command (but not control) of a dwarven settlement. The game procedurally generates a world for you, then you select a site and embark with seven dwarves and the skills and supplies that they can afford. 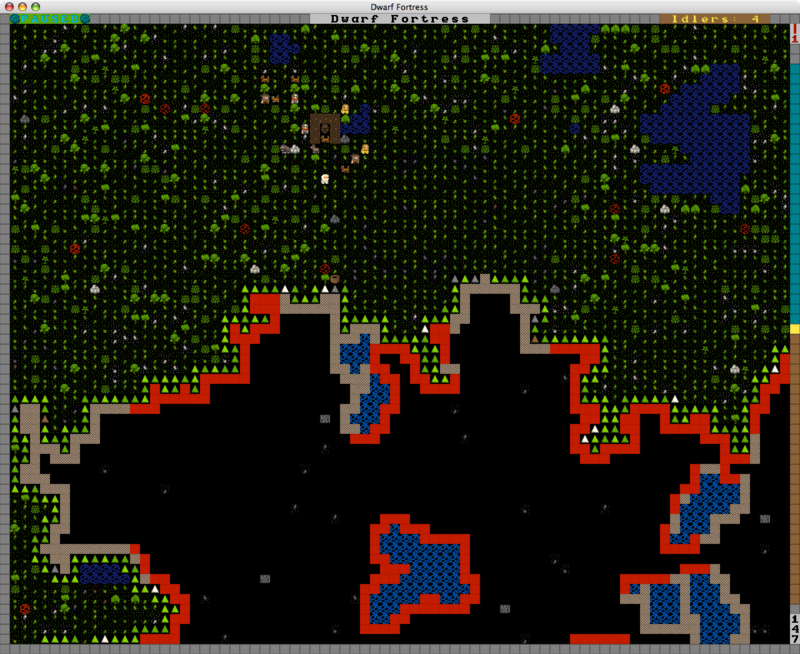 This is Dwarf Fortress, using the included standard square tileset. As you can see, it’s a little more intuitive. In this picture, you can see seven dwarves: two miners (grey), two woodworkers (yellow), two farmers (brown), and a stoneworker (white). You can also see four dogs, a cat, a donkey, and a muskox. Notable objects include the wagon the dwarves arrived in, a barrel (still in the wagon), a few scattered boulders, many trees and saplings, a number of harvestable shrubs, and, directly south of the east section of the wagon, an anthill. Ground tiles visible, besides grass and pebbles of various types of rock, include scattered patches of red sand (which will be useful for glassmaking later), and small pools of water. To the south is the side of a hill or mountain, with slopes (denoted by triangles) leading up to the next z-level. Once you arrive at the site, the game is open-ended. Generally, you try to survive and build up the fortress, but this is entirely optional. And remember Dwarf Fortress’s motto: Losing is fun! Ohh, we’re going to have so much fun. Red is even less experienced with this scrying tool than I am, and its user interface leaves a little to be desired, so before we start our joint venture he’ll be running through this excellent tutorial by 9th Court High Wizzard TinyPirate from After Action Reporter: The Complete and Utter Newby Tutorial for Dwarf Fortress. It would probably be more fun to toss him in and watch him squirm, but there are some things you just don’t do to a fellow Wizzard, even if he is a nutball. If you mortals wish to access additional knowledge regarding dwarves and their fortresses, you may view the collaborative codex. This entry was posted on December 6, 2009 at 11:52 pm and is filed under Dwarf Fortress. You can follow any responses to this entry through the RSS 2.0 feed. You can leave a response, or trackback from your own site.